Greetings! Here are six more timely topics for you to consider in this week’s Doyle’s Half Dozen. Let’s get to it! I’ve offered frequent commentary about the Planned Parenthood issue, regarding the world’s largest abortion provider getting caught selling aborted baby parts and bartering for more money. Now PP reported this week they will no longer accept money in exchange for the aborted baby parts. I could offer linked stories, but they are everywhere. You should not have any trouble finding legitimate responses that prove PP’s remarks this week demonstrate the $500 million federally-sponsored organization is buckling under pressure. They have no evidence their organization is more needed over other healthcare centers that outnumber them 10-to-1. They no longer can say they offer mammograms, which they never did. Nothing they offer is different from other medical clinics’ offerings except one thing. They perform abortions, especially late-term abortions, and they cut up the parts of those aborted babies and ship them off. Keep talking about it, friends. Don’t let down. Don’t give into weak arguments from popular personalities and political figures. The truth is being told, and it’s becoming harder for PP supporters to withstand. This week’s Democratic Presidential Debate featured five Democrat candidates, and to be honest, I didn’t know there were five Democrats running for President. The media mostly focuses on Hillary Clinton with Bernie Sanders making the news once in a while. I did know Martin O’Malley is running, but I had no idea Jim Webb and Lincoln Chaffee were also in the race. I won’t go into as much analysis as I did the previous two GOP debates, mostly because there wasn’t much content of which to draw. The biggest sound bite from the event was Sanders defending Clinton on her email scandal. This was both a joke and a political mistake. I actually thought it was a “left-handed” regard when Sanders said to Clinton “Americans are sick and tired of hearing about your (ahem) emails.” Hillary sure got excited after he said it, but I don’t see how this improves Clinton’s image. Clinton’s scandal was later referred by Chafee when he said, “We have to repair American credibility…I think we need somebody with the best and ethical standards as our next president.” Clinton was asked if she would like to respond to Chafee. She said, “No.” And laughter ensued. The best way to summarize what the candidates said is they want gun control, free college tuition, more government control and less personal responsibility. They also blame Republicans for everything that is bad. Also, one other interesting note about the list of Democrat candidates. There were four white males and a white female. The Republicans represent more minority groups among their candidates, as well as a younger generation, especially with Marco Rubio representing both… just saying. Toronto Blue Jays’ Jose Bautista smashed a three-run home run that capped Toronto’s major comeback over the Texas Rangers, advancing the Blue Jays to the American League Championship Series. As a way of celebrating his long bomb, Bautista celebrated by emphatically tossing his bat while standing at home plate. This is a common response today. Some would compare it to a football player’s touchdown dance. However, allow me to offer a perspective. Though I do not fully endorse such individual gratification, the football celebration can be interpreted as just a player excited that he scored, especially if no opponents are near. The baseball scenario of a batter facing a pitcher displays more individual implications between opponents. 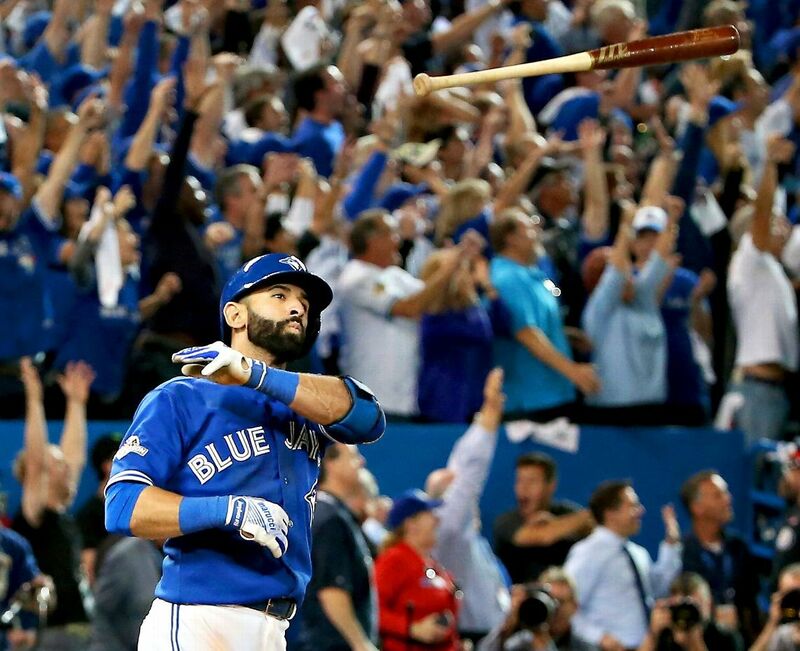 The bat flip can demonstrate a direct taunt, especially when a stare down is added. The point I would stress to any and all sports competitors is have respect for your opponent. Demonstrate graciousness both in winning and in losing. I have been participating in a fantasy football league for 20 years. The Blue Cougars, my fantasy team, has had some success over the years, advancing as far as the championship game multiple times, though never claiming a season title. This season doesn’t look good for the Blue Cougars. My first round pick this season was the same pick last season – Peyton Manning. Need I say more? In all my 20 years of playing fantasy football with friends, there has been no wagering. It has changed how I watch NFL football, but there has been no financial loss or gain among any of my league mates, which is common among many who participate in such competitions. However, the reputation of fantasy football leagues is beginning to be marred. With the recent addition of fantasy sports websites DraftKings and FanDuel and the revealing news of a DraftKings employee winning $350,000 by participating on FanDuel with “insider information,” fantasy football is becoming associated with online gambling which is illegal according to the 2006 Unlawful Internet Gambling Enforcement Act. My take is this. Most fantasy football leagues among friends and co-workers are harmless, especially if there is no wagering involved. But I would be careful how much time is spent on a hobby or an activity among friends if it causes a restraint on the participant’s time with family as well as being an example to others who may have difficulties with gambling addictions. NBA star Lamar Odom is on life-support with family by his side. “Believing in the power of prayer” is what Odom’s sister-in-law Kourtney Kardashian tweeted on Thursday. I hope prayer is offered for Odom, and I hope God will make Himself known through the observance of prayer.